At the end of 2017 Squiz, our Content Management System (CMS) provider, applied a major upgrade to the CMS. With that we got some great new functionality, like the in-line Commenting available on the Edit screen. Throughout the first half of 2018, a series of smaller revisions to the update were applied – as is usual practice – to iron out any bugs. Unfortunately, as a result of these changes our existing workflow was affected. We had reports from all around that people were experiencing confusing and misleading workflow emails. For instance, when a Content Author applied for approval, everyone with access to the content would receive an email saying that the author had approved the changes. Recently, we overhauled all workflows in the CMS to change the way they’re set up and bring it in line with the functions of the upgraded system. Now, you should find any workflow emails you receive accurately represent what has happened and what actions are required to further the process. The process itself of applying for approval and publishing content within the CMS remains unchanged – we’ve simply fixed up the communications surrounding it and streamlined the setup in the back end. 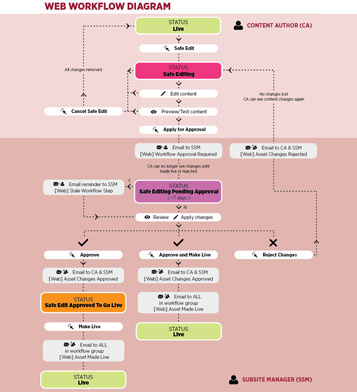 To access our fantastic new workflow diagrams, updated steps for Content Authors and Subsite Managers, and watch our walk-through video – go to our Workflow article (opens in a new window) in the Web Request Portal. 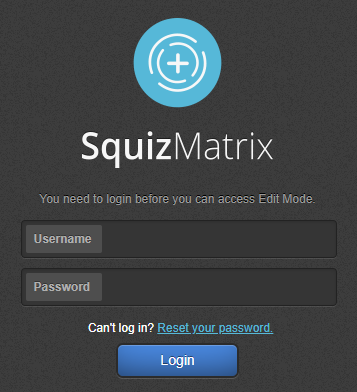 When you’re on the Squiz login screen you will now see the text “Can’t log in? Reset your password” sitting just above the login button. If you have tried to log in once or twice and have been unsuccessful, click on this link and follow the prompts. Make sure you submit your CMS username to have your password reset. It won’t work if you type in your email address because it’s not defined by the CMS as a unique identifier. Having the ability to reset your own password can get you back into the system sooner! There are still security measures in place though, so if you’ve locked yourself out by getting your password wrong 3 times, you’ll still need to raise a support ticket to have your account reactivated by the team. For many years, our internal search has been notoriously bad and thus under-utilised. The good news is we are currently working with ITDS to upgrade it! Ability to segment results into various categories to help you find exactly what you’re looking for faster – documents, courses, people etc. You can expect to see more improvements being released later in the year as we work on making search smarter and improve the prioritisation of search results. Let us know (opens in a new window) how the new search is working out for you and what you think needs improving. On 1 August, we happily welcomed John H. Gonzaga to the team as our fourth and final Digital Producer. With all positions in the team now filled we have a greater capacity to fulfil our mandate of developing a first-in-class digital experience for all our users, whilst supporting the CMS Community with increased training and support materials, expert digital guidance and technical assistance. Some of you may remember John from his days as a Web Coordinator, Web Forum Master of Ceremonies or even Web Trainer? If you do, you will likely know how lucky we are to have him back at the University in this new role. Watch our video above to get to know John and hear what excites him about his new role! I’m a big fan of really good customer experiences and love the challenge to create them for our students and other stakeholders. My professional background is in communications, and I like to help you understand what we do and translate technical speak into normal language. I am a creative at heart and love great UX and design. My professional background is in media - I was a television producer for 10 years before making the switch to digital. When I'm not in the office, chances are that I'm hanging out with my dogs, Slinky and Squiggle. I am a troubleshooter and love to be stumped. 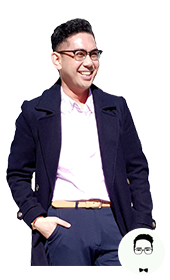 My professional background is design and my job entails building a better digital experience for students and staff. I love to learn and my interests are in science, art and the occasional dog meme. I have the great pleasure of developing and delivering our training and support resources. I like to make things fun so you enjoy engaging with them and remember what you learn! I myself am currently learning Auslan (Australian Sign Language). Plus, I love cats. Dan doesn’t like talking about himself, but the team thinks he deserves a mention. Also known as the Web Guy, Dan spends his days troubleshooting, strategising and performing all sorts of internet magic. He's the guy with the blue dreadlocks and cool t-shirts. Keen to be the first to hear about these? Subscribe to our Web Updates to receive these and other web notifications right in your inbox.